How To Eat Sensibly through the festive season. They say that someone once asked Lord Buddha “What is POISON“? His answer was simple-“Every Thing EXCESS In Life Is Poison”!!! Words of wisdom which holds good even today. Excess of even the good things in life can bring with it,it’s own set of problems! This is true even with festive food these days. Sometime back I remember discussing our change in food habits and the increasing problem of obesity and other health problems that India (and Indians all over the world) are now facing, and a friends father’s put it nicely as “Hamare zamaane mein Diwali saal mein ek baar manayi jaati thi. Aaj kal tho log Diwali roz manate hein!! 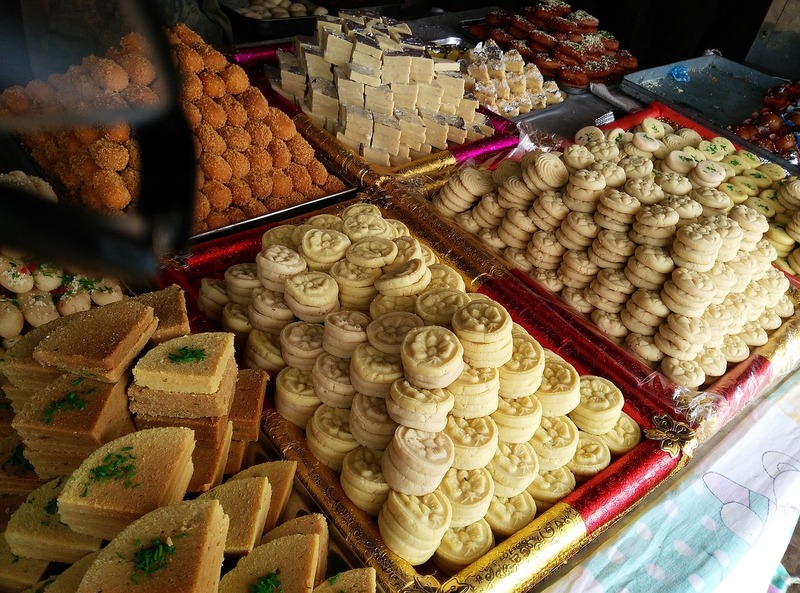 Translated into English, “In our time, Diwali (the main festival for Hindus) used to be celebrated once a year and we would indulge ourselves on sweets and other festive food. These days it’s like Diwali is celebrated daily as people eat sweets and other high-calorie food on a regular basis”. With Indians being able to spend more on food, waiting for a festival to gorge on sweets doesn’t seem to be worth it anymore. No surprises that India is not only seeing an obesity epidemic but will also soon be crowned the “Diabetes capital of the World“!! Most Indians find it difficult to eat sensibly right from October till January. Navarathri(which generally falls sometime in October) usually heralds the start of the festive binging, then comes Diwali in October/November, Christmas in December and then finally New Year! For Indians living outside India,-there’s also Halloween and Thanksgiving around the same time to deal with. To top it all, the cold winter months brings on food cravings.With so much tempting reasons for festive food, how does one stay on track with healthy eating? Don’t skip out on your exercise during these months. Enjoy the festive food, but stick to portion sizes. Try to have a small snack, soup, sandwich, yogurt and fruits before leaving for a party-that way you won’t be very hungry when you arrive at the party. While planning a dinner/party during the festive season, try not to put all the festive food (read: pooris, mixtures/chivda/farsaan, parathas, pakodas, biryani’s,jelebis,gulab jamuns) on the menu at the same time. Choose two or three items and then balance it out with healthy food. Include salads/raitas and fresh fruits in the menu. Serve fresh juices instead of soda/aerated drinks. Instead of gifting your friends and relatives sweets or chocolates, think healthy and gift them with exotic fresh fruits, fruit bouquets, dry fruits and nuts, gourmet coffees/teas or even some herbal spa products or a spice/flowering plant. The idea of celebrating a festival should not be centered on overeating festive food but getting into the spirit of the festival. Eating smart or sensibly through these months will ensure that you don’t end up with health problems in the New Year. Here’s wishing a Happy, HEALTHY and Prosperous Diwali to all ! !